The Quality Hotel Friends is a popular choice for all kinds of events. Guests can enjoy modern conference facilities and a convenient location at Arenastaden in Solna, just north of Stockholm. We are very proud of our modern and flexible conference facilties that can accommodate all kinds of different events, but we also want the hotel become to a natural place to hang out with friends, family and colleagues. In essence, we want to welcome you to Arenastaden's living room! Enjoy a delicious buffet breakfast in the In Between​ restaurant, have after-work drinks in the Bar X lobby bar, or round off a great day with dinner at our Brasserie X restaurant on the 25th floor. Come to this cosy and vibrant space to rest tired feet after a long day of shopping at the Mall of Scandinavia, or get warmed up for a concert at the Friends Arena. The Quality Hotel Friends welcomes everyone! The Quality Hotel Friends sounds friendly, doesn't it? Well, we certainly love the name! 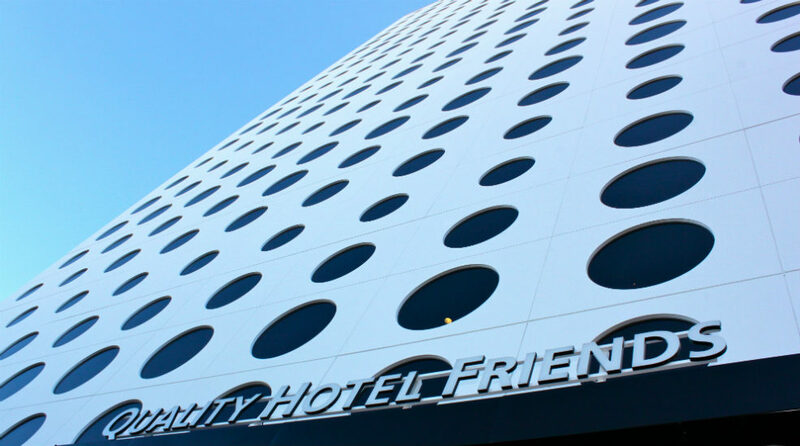 In October 2012, Quality Hotel became the first chain of hotels to collaborate with the anti-bullying organisation Friends. Their goal is to create a society in which children and young people grow up enjoying safety and equality. We strongly believe in these values at Quality Hotel and make sure to uphold by them in our daily operations. In 2015, the Mall of Scandinavia opened in Arenastaden. This huge shopping centre is literally just steps from the Quality Hotel Friends. Shoppers can exlore the latest fashion, sports equipment and beauty products, as well as furniture and technology under one roof. And when it's time to put your feet up, you won't have far to go! Simply walk through the shopping centre from Solna train station to reach the hotel. The fastest route is via the exit between the main entrance and O'Learys. Room cleaning of course included when you stay at the hotel, but you will have to hang the "Please clean my room" sign outside your door by 11pm the night before (applies to stays of more than one night). Every time you choose not to have your room cleaned, we will donate 10 SEK to UNICEF and the Sweet Dreams Stay project, which helps us to care for the environment and children at risk of human trafficking. Find out more about Sweet Dreams Stay here. The Quality Hotel Friends is a cash-free hotel. This provides a safer working environment by reducing the risk of theft and burglary. More information about this can be found under FAQs. You'll be ideally situated to explore Stockholm when you stay here as the hotel is just 5 km from Stockholm Central Station. You can read more about Stockholm here. We hope to see you soon at the Quality Hotel Friends – let us help you arrange events to make special occasions truly memorable! Take the northbound 40, 41, 41X or 42X commuter train as far as Solna station (choose exit Friends Arena). Walk to the hotel through the Mall of Scandinavia (exit by O'Learys). Take the northbound Blue line to Näckrosen metro station. A few minutes walk to the hotel. Take the 502 or 505 bus from the Solna centrum metro station to bus station Arenan (located on Evenemangsgatan). Take the commuter train to Solna station. Or, take Flygbussarna Airport coaches to bus station Järva Krog or Haga Norra. BRA's electric bus from Bromma Airport to Arenastaden. or Taxi Kurir, phone: +46 8 30 00 00.
approx. 500 metres, about a ten minute walk.